Photo Caption: Four Connors State College students have been selected to present at the 2018 National Conference on Undergraduate Research in April held this year at the University of Central Oklahoma in Edmond. 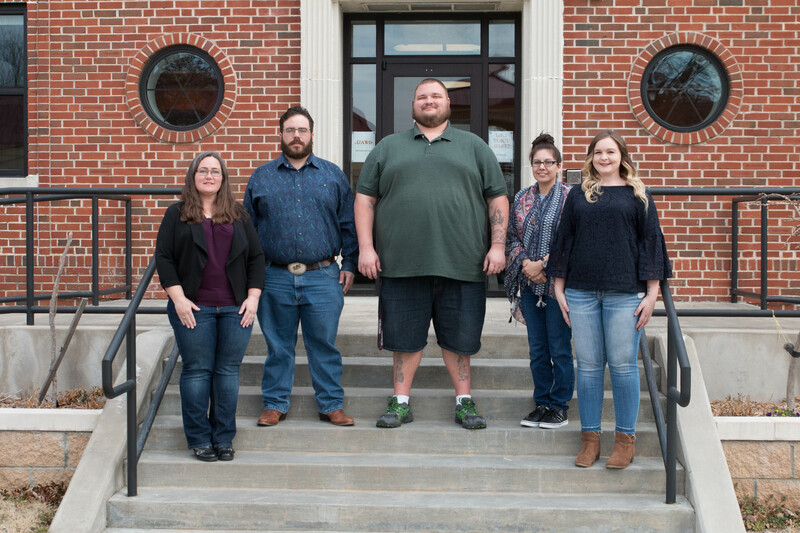 (L to R) Shyanne Ledford, CSC Sociology instructor and research mentor, Hank Coppin, Keefeton sophomore, Jeremy Thompson, Gore freshman, Rhiannon KaShay Moore, Broken Arrow sophomore, and Hailey Varnell, Porum sophomore. Four Connors State College students have been selected to present at the 2018 National Conference on Undergraduate Research in April held this year at the University of Central Oklahoma in Edmond. This conference is specifically designed for undergraduates to present on their research. Shyanne Ledford, Sociology instructor, said these four students were given ten days to put together their abstracts, and all four submissions were accepted. The 2018 NCUR is the premier forum showcasing undergraduate student research and innovation. Thousands of student presenters and faculty research mentors, representing national and international colleges and universities will make their way to Edmond in the spring. The students were selected through a competitive review process and will represent all academic disciplines and share their research as a scholarly poster and oral presentation. The students representing Connors State are: Jeremy Thompson, Gore freshman; Hank Coppin, Keefeton sophomore; Hailey Varnell, Porum sophomore; and Rhiannon KaShay Moore, Broken Arrow sophomore; Shyanne Ledford will also attend as their research mentor. Along with the presentations, the students will have an opportunity to attend the many conference workshops held, and have opportunities to meet and engage with guest speakers, and to interact with like-minded peers from around the world. Rhiannon KaShay Moore considers herself to be environmentally aware and stated she has noticed an increase in earthquakes within the past five years since fracking has becoming more prevalent in the state. Her abstract is titled “Misleaders of Fracking: What citizens and policy makers need to know”. Hank Coppin’s abstract is titled “Misinformation: The role of media and the lasting effects”, his presentation will show the different ways misinformation is being used in the media and he plans to elaborate on the negative ways the media impacts people’s lives. Jeremy Thompson will be presenting his abstract titled: “Prison to Prison Pipeline”, and his take a hard look into reforming correctional facilities and discussing how we rehabilitate the incarcerated, based on current models. Hailey Varnell’s abstract titled “Beauty standards: Helpful of harmful?”, with this topic, she will discuss whether or not eating patterns may exist because of unrealistic beauty standards perpetrated and upheld by various social institutions. “I hope by analyzing the relationships between society’s expectations of beauty and eating disorders, that it may reveal harmful effects stemming from the socially constructed standards of beauty that are perpetrated today,” said Varnell. Ledford said she is extremely honored to work with future researchers who are fresh, excited, and passionate about their topics. Ledford said she has been fully supported by Connors administration during this process and thanks them for removing any barriers they have encountered along the way.